Are the attacks on the Vatican anti money-laundering law attacks against Holy See sovereignty? Benedict XVI. Between Benedict, Bonaventure and Gregory. 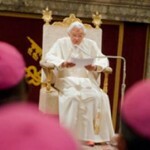 In 2008, Benedict XVI spoke to participants in the Study Congress organized by the Pontifical Council for Legislative Texts, on the occasion of the 25th anniversary of the promulgation of the Code of Canon Law. In that occasion, he quoted Antonio Rosmini: «The human person is the essence of law». And he said: «The ius ecclesiae is not only a body of norms formulated by the Ecclesial Legislator for this special people who form the Church of Christ. It is, in the first place, the authoritative declaration on the part of the Ecclesial Legislator of the duties and rights that are based in the sacraments and are therefore born from the institution by Christ himself». Maybe the key of the quiet revolution of Benedict XVI can be found in this speech. It is – one would say – a twofold revolution. On one side, he aims to reinforce the Faith and to turn back the People of God to God. Too busy in worldly affairs, the People of God seem to have lost his polar star. The Year of Faith that will begin the next November, the Year of Priests in 2009, the Pauline Year in 2008 – all of these events prepared by catechesis, homilies, speeches during the General Audiences which the Pope conceived as the most important part of his Magisterium – are part of this project to turn the People of God to Faith. The Pope wants adult faithful. He aims to a Faith which is feed with the Reason. in view of their Admission to the Seminary and to Holy Orders» , that regulated the criteria of access to seminaries. The last act has been the reform of Caritas Internationalis. In the middle, a series of hidden but necessary reforms.. In fact, during the last years of John Paul II’s Papacy – and one should also say from Pastor Bonus on – the documents issued were not so firmly hooked to juridical sources, but more often to theological-pastoral ones. Under this, many had the occasion to abuse of their unprecedented freedom. The result has been a great confusion within the several bodies and organizations of the Catholic Church. This confusion Benedict XVI wants to clear up. The General Decree that reform the Statutes of Caritas Internationalis are part of this «quiet legally-oriented revolution» brought on by Benedict XVI. This is why it is so important to understand what this reform really is. First, it is important to point out what Caritas Internationalis really is. What is Caritas Internationalis? Is it a self governing body with an autonomous Statute, or is it a branch of the Pope? The Pope – according to the Chirograph During Last Supper – gave to Caritas Internationalis the technical status of a public juridic person. According to Canon Law (Can. 116) «public juridic persons are aggregates of persons (universitates personarum) or of things (universitates rerum) which are constituted by competent ecclesiastical authority so that, within the purposes set out for them, they fulfill in the name of the Church, according to the norm of the prescripts of the law, the proper function entrusted to them in view of the public good; other juridic persons are private». This is why Caritas Internationalis can be considered the tool the Pope uses to favor charity in the world. The Chirograph had a virtue and a limit at the same time. The virtue was that the sources quoted were more thelogical-pastoral than juridical. So, Caritas Internationalis could not be figured out as a tool in the hands of the Pope, since the Chirograph lacked of juridical tools to assure it. Curial offices seemed to have just a moral authority on Caritas Internationalis, but they did not have – in fact – a juridical authority. This favored the fact that Caritas Internationalis could have a complete independence toward both the States and the Holy See. Thus having the opportunity to include under its «umbrella » organizations that were not so aligned with the moral teachings of the Catholic Church. The new statutes better sketch the competences of each body involved with the Caritas Internationals. That, since it is a tool of the Pope, is obviously controlled by the Secretary of the Pope. That is, the State Secretariat. The new Statute of Caritas internationalis strenghten the cooperation between Caritas Internationalis and Holy See. At the same time, the competences of the Vatican State Secretariat are better outlined: the State Secretariat is called to be center and joint of the Church. Benedict XVI began this renewal long time ago, but this latter became visible for the first time when the Pope appointed cardinal Tarcisio Bertone – a canonist that served as secretary of the Congregation for the Doctrine of the Faith – as Secretary of State, even if Bertone himself proclaims himself «Secretary of Church». 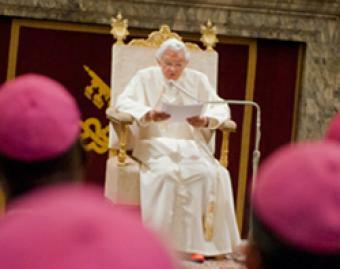 The program of renewal of Benedict XVI aims to make lively and present the identity of the Catholic world. «Charity in Truth» is the title of the «social» encyclical by Benedict XVI, and it is also is «plan to govern». The new Statute of Caritas Internationalis, went into effect on May, the 2nd (when it had been published in the Osservatore Romano) show once more that «Charity in Truth» is the path Benedict XVI is treading to bring the Church to the Year of Faith. The new Statute of Caritas Internationalis deeply outlines the competences of the dicasteries involved with Caritas internationalis. First of all, the role of the Pontifical Council Cor Unum - i.e. the Vatican office responsible for coordinating and promoting charitable giving. – is strengthen. In the very first article of the General Decree, Cor Unum is described as «the dicastery qualified about Caritas Internationalis, its observance of this decree and its normative of canon public juridic person, as well as to control and watching, except for what established in the articles that will follow». Caritas Internationalis must address to Cor Unum before issuing any text with doctrinal and moral contents. Some more details of the decree: it contains new guidelines for the Caritas Internationalis personnel labour standards and it strengthens the roles Vatican offices and the pope play in working with the charity confederation, including naming and approving new board members and approving its texts, contracts with foreign governments and financial transactions. It also creates a special «support commission» of legal, technical and organizational experts named by the pope to help the organization follow the new norms as well as canon law and the laws of Vatican City State concerning the procurement and distribution of aid, and employment of workers. At least three members of Caritas’ executive board will be papal appointees, and Pope Benedict XVI named U.S. Bishop Bernard A. Hebda as one of them. the need of the Holy See nihil obstat (that is «nothing obstructs») for the candidatures to President and General Secreatary – as already previewed in the Chirograph During Last Supper, and – unlike the previous Statutes – also for the candidature of the treasurer. The Pope told the assembly that the Vatican is responsible for following the activities of Caritas and «exercising oversight to ensure that its humanitarian and charitable activity, and the content of its documents, are completely in accord with the Apostolic See and the church’s magisterium». Other new elements that laid on the Decree: Cor Unum will name an ecclesiastical assistant whose role will be to foster «a spirit of communion» between the Vatican and members of the organization, foster reflection on theological questions and promote Caritas’ Catholic identity; the list of candidates for president, secretary general and now treasurer will require approval from Cor Unum, the Secretariat of State and the pope; the new papal appointees to the executive board are Bishop Hebda, Archbishop Paul Yembuado Ouedraogo of Bobo-Dioulasso in Burkina Faso, and Maronite Archbishop Youssef Soueif of Cyprus; that Caritas Internationalis and all of its employees, including those working on contract, will have to abide by the new norms, the norms of canon law and the laws of Vatican City. The qualification of the Vatican Secretariat of State are better outlined. The first section of the State Secretariat must defend the juridical status of Caritas Internationalis, coordinate the qualification attributed to dicasteries – the Pontifical Council Cor Unum and the other dicastieries qualified with the Vatican City State administration -, assist the «Pontifical Council Cor Unum in the vigilance on the transparency of the administration of patrimony and finance of Caritas Internationalis». The second section of the State Secretariat holds «the relationships with the political, diplomatic, administrative and juridical authority of the States, particularly with the Italian State, as well as the relations with the Regional and International organization»; approves the agreements of official financing coming from governments and International Organizations and the agreements of cooperation and the other official agreements with the governments; it manages the disputes (if and how Caritas internationalis would appeal to a civil or international court to solve a contention). The revision process began in 2007 as a follow-up to Blessed John Paul II having raised the technical status of the federation to a «public juridical entity» of the church in 2004. The new status formally recognized that Caritas carries out its charitable activities in the name of the Catholic Church and it meant the organization would function under the administration of the Vatican. Prepared by the Secretary of State in conjunction with the Pontifical Council Cor Unum, the Pontifical Council for Legislative Texts and legal experts, the decree said it was meant to «complete and interpret» Caritas Internationalis’ juridical status and give the organization a legal foundation and reference point for the application of the new statutes. Msgr. Osvaldo Neves de Almeida, an official in the Vatican’s secretariat of state, said in an explanatory statement accompanying the decree that the updated status was meant to better support the federation’s activity. Given Caritas’ worldwide presence, international profile and that it acts in the name of the church, the Vatican «has the task of following its activity and exercising vigilance in order that both its humanitarian and charitable action and the content of the documents that it disseminates may be in harmony with the Apostolic See and with the church’s magisterium, and in order that it may be administered with competence and transparency», the monsignor wrote. According to the new norms, the Congregation for the Doctrine of the Faith will continue to give doctrinal oversight to texts that are of a moral or doctrinal nature and the Prefecture for the Economic Affairs of the Holy See will continue to monitor the administration of temporal goods. Cardinal Robert Sarah, president of the Pontifical Council Cor Unum, said in a statement that the new legal framework does not apply to national Caritas organizations, which will maintain their autonomy; however, the new norms «could inspire the bishops and bishops’ conferences to eventually review their diocesan or national Caritas statutes». The new tidiness of Caritas Internationalis is aimed to give more coordination to dicasteries and organisms linked to the Holy See. This enhanced coordination has been requested by Cardinal Bertone in his preliminary document for the periodical meeting of the head of Curial Dicasteries in January. Benedict XVI is bringing on a general reform of the Curia, in order to fully bring into effect the Pastor Bonus, the pastoral Constitution about the Roman Curia. In Pastor Bonus, the State Secretariat is indicated as the body that must coordinate the work of all the dicasteries. Benedict XVI’s general reform dealt with Vatican financial branch (it has come into effect the new Vatican anti-money laundering law n. 127, which also outlines the competences of the State Secretariat); deal with the reform of the Prefecture for Economical Affairs, that has now become the Vatican correspondent to a Ministery of Finance; deal with more dialogue and cooperation among the Curial office. It is not a concentration of power, it is more a coordination of power. Exactly what Vatican bodies lacked of. Anyway, coordination is also about doctrinal issues. The search for truth, the truth itself, can be considered the main commitment of the Benedict XVI’s Magisterium: the Pope dedicated to the truth his firs message for the World Day of Peace (In Truth, Peace 2006) and several times he claimed for a Faith more adherent to the Truth of Gospel, without justifying relationships and positions that denaturalize the Catholic Thought. Recently, this commitment of the Pontificate – that the State Secretariat is bringing on – has become evident when the Secretariat of State avoided to the Catholic University of Perù to define itself anymore as «Pontifical». But it has been very meaningful last year, when the Caritas Internationalis had to elect its new general Secretary. Last year, Vatican Secretariat of State did not give the nihil obstat for the re-candidature of the previous General Secretary Lesley-Anne Knight, notwithstanding his job had been praised by the same president of Caritas Internationalis, card. Oscar Andrés Rodriguez Maradiaga. Michel Roy – a French that previously served in the French association Secours Catholique, and he knows what does mean working in a highly secularized country, where it is of great importance to define and defend the Catholic identity – had been appointed as the new General Secretary. Caritas Internationalis, whose original statutes were approved by the Vatican in 1951, is made up of 164 Catholic relief, development and social service agencies working in almost 200 countries. Most of the member agencies are Caritas or relief and development agencies sponsored by national bishops’ conferences, such as the U.S.-based Catholic Relief Services or the Canadian Catholic Organization for Development and Peace. The CCODP, a Caritas member organization supported by the bishops of Canada, has come under fire from pro-life groups for supporting organizations that advocate the legalization of abortion, distribute contraceptives, and support homosexualist policies. Knight vigorously defended CCODP in a letter sent to donors and obtained by LSN. Similar problems also exist with other Catholic international aid organizations sponsored by other national bishops’ conferences and that this was a disturbing and unacceptable trend. These bishops’ conferences were not conducting proper oversight over their international development and aid organizations resulting in the funding of groups whose objectives are in serious conflict with Catholic teaching. The risk is that Caritas Internationalis could be the «umbrella» of a series of organization whose purposes seriously contrast with the Catholicism. Changes in the Vatican’s approach to international aid appear to be part of the general reform project outlined in Pope Benedict’s recent encyclical letter Caritas in Veritate (Charity in Truth). The encyclical insisted that human development and foreign aid cannot be separated from the demands of truth. In the encyclical, the Pope underlined that «some non-governmental Organizations work actively to spread abortion, at times promoting the practice of sterilization in poor countries, in some cases not even informing the women concerned. Moreover, there is reason to suspect that development aid is sometimes linked to specific health-care policies which de facto involve the imposition of strong birth control measures. Further grounds for concern are laws permitting euthanasia as well as pressure from lobby groups, nationally and internationally, in favour of its juridical recognition». There is the need to prevent the risk that these organization get a «Catholic umbrella» to what they do. In fact to understand the basis of the «policy of Charity» of Benedict XVI, we should re-read his first encyclical Deus Caritas Est. In this encyclical, Benedict XVI affirms that «the Church’s charitable organizations, on the other hand, constitute an opus proprium, a task agreeable to her, in which she does not cooperate collaterally, but acts as a subject with direct responsibility, doing what corresponds to her nature. The Church can never be exempted from practising charity as an organized activity of believers, and on the other hand, there will never be a situation where the charity of each individual Christian is unnecessary, because in addition to justice man needs, and will always need, love».